It’s hard to believe, but it’s been more than a year since I became dean of the Boonshoft School of Medicine. Now that I’ve had time to settle in and get to know everyone, I’m even more amazed by the dedication, innovation, and commitment to excellence I’ve seen here. I have found the Boonshoft School of Medicine to be a jewel, often hidden, and less well known than it should be. In my meetings with our alumni, I have come to understand just how proud of their medical school they are. We have the proudest graduates I have ever met, and with good reason. The Boonshoft School of Medicine has kept its eye on its mission, in spite of health care environments that would push it otherwise. I have learned that we are a great value-added school. We admit enthusiastic students with a great sense of passion, and we help them become even greater along the way. We take enthusiasm and permanently ingrain mission. As dean, it has been my distinct pleasure to meet the students, faculty, staff, and alumni of the medical school and to learn their incredible stories. In this issue of Vital Signs, you’ll meet some of those individuals. Our faculty are leading the way with cutting-edge research. We’re pleased to report on Dr. Julian Cambronero’s discovery of a mechanism to slow tumor growth and metastasis in breast cancer, and Dr. Thomas Brown’s research into preeclampsia, a life-threatening condition for both mothers and babies. Our alumni are making a difference in their communities nationwide. You’ll meet Dr. Nathan Schlicher, a graduate of our emergency medicine residency program who became the youngest state senator in Washington State, 1989 grad Dr. Ronald Golovan who serves as team physician for the Cleveland Indians, and 2008 grad Dr. Bryan Jewell who helped deliver a baby orangutan at Zoo Atlanta. And our students are gaining recognition at both the state and national levels. You’ll meet recent graduate Dr. Casey McCluskey, who as a medical student overcame breast cancer and went on to receive a national public health award, fourth-year student John Corker who received an AMA Physician of Tomorrow Award, and third-year Topaz Sampson who serves as the 2013-14 president elect of the national Student National Medical Association. These are just a few of the remarkable stories featured in this issue. I look forward to introducing you to more members of the Boonshoft School of Medicine family in upcoming issues. Marjorie A. Bowman, M.D., M.P.A. Boonshoft researcher Thomas L. Brown is making strides in preeclampsia research. Kelly Long’s date with trauma began one predawn morning last year when the normally “super-cautious” cattle farmer made a rare misstep. She was sure there was a safe distance between the newborn calf she was about to tag and its 1,400-pound mother. But this was no ordinary mother—cow No. Wright State professor Julian Gomez-Cambronero discovers mechanism to slow tumor growth and metastasis in breast cancer. When Marjorie Bowman, M.D., M.P.A., became dean of the Boonshoft School of Medicine on October 1, 2012, she brought with her years of experience serving at some of the premier medical schools in America. Wright State University’s Boonshoft School of Medicine is expanding its global reach under a new agreement that enables a new medical school in Saudi Arabia to get started in an innovative way, bringing the best of Wright State’s medical education expertise to a new set of students. Under the agreement, Unaizah College of Medicine of Qassim University, Saudi Arabia, will deliver a concurrent educational experience for its students, parallel with the Boonshoft School of Medicine’s medical education program. Twenty-six clinicians affiliated with Wright State Physicians and faculty of the Wright State University Boonshoft School of Medicine were named to the 2013 Best Doctors® in America list. They represented almost a third of the 81 Dayton area doctors named. Eight Boonshoft School of Medicine alumni who practice locally also were included on the list. The Boonshoft School of Medicine has charted its course for the next five years with the adoption of a new strategic plan. The plan was approved by the medical school’s executive committee in August 2013. Development of a new strategic plan was undertaken as part of the university-wide strategic planning process to determine the path for Wright State University through 2018. The national Accreditation Council for Continuing Medical Education (ACCME ® ) awarded the Boonshoft School of Medicine Continuing Medical Education (CME) Accreditation with Commendation at its July 2013 meeting. Accreditation with Commendation is awarded nationally to only a few CME providers that demonstrate compliance in 22 criteria. The ACCME commended the medical school for meeting the accreditation requirements and for demonstrating that it is a learning organization and a change agent for the physicians served in the Miami Valley. The American Academy of Family Physicians (AAFP) honored the Wright State University Boonshoft School of Medicine with a Top Ten Award for its consistent commitment to meeting the nation’s need for family physicians. Ann E. Burke, M.D., has been elected as a director of the American Board of Pediatrics and the American Board of Pediatrics Foundation. The Wright State University & Premier Health Neuroscience Institute was unveiled on February 24, 2010, with the promise to speed the transfer of research discoveries from bench to bedside, improving the diagnosis and treatment of neurological disorders such as stroke. Exposure to secondhand smoke may lead to worsening of pediatric kidney disease. In adults with chronic kidney disease (CKD), cigarette smoking is associated with an increased risk for CKD progression and transplant failure. Now, a first-of-its-kind study by researchers at Dayton Children’s Hospital and Johns Hopkins University has found a possible similar effect in children with kidney disease who are exposed to secondhand smoke. Researchers at the Boonshoft School of Medicine are leading the charge in understanding what makes people different. Their research is providing physicians with a greater understanding of human growth and development. But it can also provide valuable insights useful to another field of scientific discovery: physical anthropology. Approximately 16 million Americans used a prescription drug for nonmedical reasons in 2010, according to the National Institute on Drug Abuse (NIDA). Many of those drugs were painkillers, or pharmaceutical opiates such as hydrocodone (Vicodin ® ) and oxycodone (Percocet ® , OxyContin ® ). Robert Peter Turk, M.D., Colonel, USAF (Ret. ), professor emeritus at the Boonshoft School of Medicine, passed away on Thursday, Jan. 16, 2014, at Hospice of Dayton. He was 82. Dr. Turk will be remembered as a committed physician, a scholar, and an outstanding educator. He touched the lives of many people during his service to the Dayton medical community and the nation. Born in Hopelawn, New Jersey, Dr. Turk served his country during the Korean War from 1950 to 1954. A former teacher, 2013 graduate Casey McCluskey overcame cancer, applied lessons learned to caring for kids, and received the U.S. Public Health Service 2013 Excellence in Public Health Award. For Casey McCluskey, M.D., M.Ed., the path to obtaining her medical degree was a circuitous journey. Diane Bizimana always wonders why her life was spared during the 1994 ethnic conflict in Rwanda. Nathan Schlicher, M.D., 30, was the youngest senator in the Washington State Senate. But being the youngest is nothing new for him. As a child, he progressed quickly through school and graduated from high school at 14. He selected Pacific Lutheran University for college, because he could live on campus. He finished his undergraduate education in three years, earning degrees in biology and political science. Alan P. Marco, M.D., M.M.M., FACPE, has been appointed associate dean for faculty and clinical affairs at the Boonshoft School of Medicine and president and CEO of Wright State Physicians. Alarmed about the number of uninsured Americans—48.6 million—John Corker began studying health policy as an extracurricular passion in 2005 as an undergraduate at the University of Notre Dame, a passion that he has continued to cultivate as a medical student at the Boonshoft School of Medicine. The Boonshoft School of Medicine chapter of the Student National Medical Association (SNMA) hosted the 2013 SNMA Region V Conference, “Leadership in Medicine: Going Beyond the Clinic,” last fall at Wright State University. About 100 medical, pre-medical, and high school students attended the regional conference, which was sponsored by the Boonshoft School of Medicine, Premier Physician Services, and Doctors in Training. On a snowy Saturday morning in February, William went to a health screening at the St. Vincent de Paul Gettysburg Gateway for Men homeless shelter. But this wasn’t a typical health clinic. After Boonshoft School of Medicine students took his blood pressure and checked his glucose levels, William sat down with another group of students who asked him questions about his health and helped him develop ideas to better manage it. Boonshoft School of Medicine student T.J. Klein has been selected for a Fulbright U.S. Student Program fellowship for 2013-2014 to study autism in Oman. The Fulbright U.S. Student Program is the largest U.S. exchange program offering opportunities for students and young professionals to undertake international graduate study, advanced research, university teaching, and primary and secondary school teaching worldwide. Boonshoft School of Medicine fourth-year student Kyle Davis was one of 15 recipients nationwide to receive the 2013 American Medical Association (AMA) Foundation Physicians of Tomorrow Award. Diagnosed at six months with hemophilia, a rare blood clotting disorder caused by inactive or deficient blood proteins, Davis has known since he was a child that he wanted to enter the pediatric hematology/oncology field. Sampson, now a third-year medical student at the Wright State University Boonshoft School of Medicine, was selected the 2013-2014 president-elect of the Student National Medical Association (SNMA), the Boonshoft medical student selected president-elect of Student National Medical Association oldest and largest student-run organization focused on the needs and concerns of medical students of color. For the second consecutive year, three fourth-year Boonshoft School of Medicine students have won the statewide student Doctor’s Dilemma ® contest, a medical jeopardy competition. Doug Laurain, Luke Andera, and Robert Beaulieu competed against other medical students teams in Doctor’s Dilemma ® at the 2013 Ohio Chapter Scientific Meeting of the American College of Physicians (ACP) in Columbus last fall. The Boonshoft School of Medicine welcomed 104 new students during the Convocation and White Coat Ceremony last July, formally marking the start of their medical education. Last year for the first time, each student received a stethoscope engraved with the words, “Excel in Leaving a Mark,” thanks to The Jason Madachy Foundation. The foundation has given more than 700 stethoscopes to medical students nationwide. The path to medical school is as diverse as the people who traverse it. Here are the stories of just a few of our 2013 grads. One of seven children, Jeff Otte grew up on a pig and dairy farm in Maria Stein, Ohio. As the fifth child of a nurse and a farmer, Otte wrestled with whether to be a farmer or become a doctor. His curiosity in the sciences pushed him to pursue a career in medicine. One-hundred and seven members of the Boonshoft School of Medicine class of 2013 received their M.D. degrees during the school’s commencement ceremony at the Benjamin and Marian Schuster Performing Arts Center on Friday, May 24. As a Cleveland-based private practice internist, Ronald Golovan, M.D., (’89) has spent 22 years treating professional baseball players, musicians, actors, and corporate executives. However, he is quick to point out that some of the most satisfying moments of his career have come from his involvement in the health care of his more typical internal medicine patients. When Bryan Jewell, M.D., was a student at the Boonshoft School of Medicine, he never imagined he would be part of a team that performed a C-section on an orangutan. But on Jan. 10, 2013, Jewell worked with his business partner, Brad Moore, M.D., to perform a C-section and deliver the baby orangutan with the assistance of a team of animal doctors at Zoo Atlanta. A team of neonatologists from Children’s Healthcare of Atlanta cared for the newborn male infant, Pongo. In March 2013, 104 graduating Boonshoft School of Medicine students learned where they will pursue their residency training. 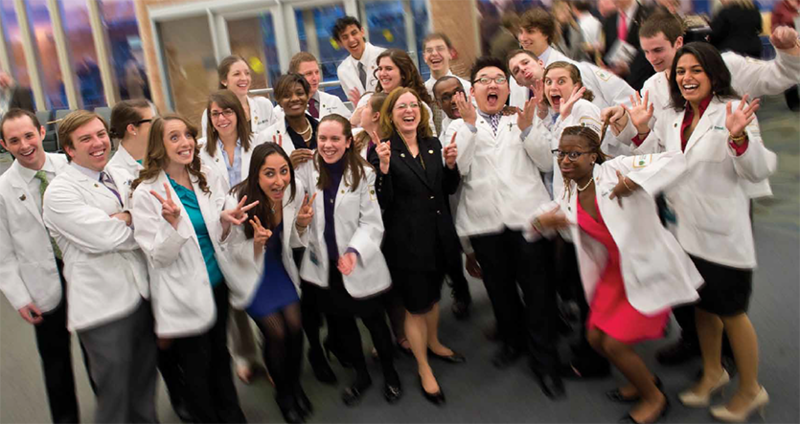 Gathered with family, friends, and other supporters in the Berry Room of the Wright State University Nutter Center, the students took part in the national event that has become a rite of passage for those on the brink of becoming physicians. We’re proud of our alumni and graduates of our residency programs and want to spread the word about your achievements. If you have professional news or personal updates to share—or simply want to stay in touch—please contact the Office of Advancement at som_adv@wright.edu or 937.245.7610. John Lyman, M.D., FACEP, was named president of the Ohio Chapter of the Americal College of Emergency Physicians in June 2013. Sunday, March 23, 5:30–7:30 p.m.
1111 14th Street, Denver, Colo.